NHRALynsi Snyder became president of the company at age 27. Lynsi Snyder, the president of In-N-Out Burger, is popular with her employees. The billionaire In-N-Out heir has a 96% approval rating on Glassdoor. In-N-Out Burger employees love their boss. As of Thursday, a stunning 96% of respondents on Glassdoor had given In-N-Out’s president, Lynsi Snyder, a positive review. In total, 1,175 employees posted about their experience at the burger joint. And In-N-Out’s success on Glassdoor doesn’t end there. This year, the job site ranked Snyder, 36, the fourth-best CEO in the country. And her fast-food chain has been listed as one of the best places to work in the US every year since 2015. A new Forbes profile of Snyder, who the news outlet estimates is worth $US3 billion, points to how exactly she and her company have been able to earn the loyalty of In-N-Out associates. Notably, the profile, published Wednesday, put her employee approval rating even higher, at 99%. 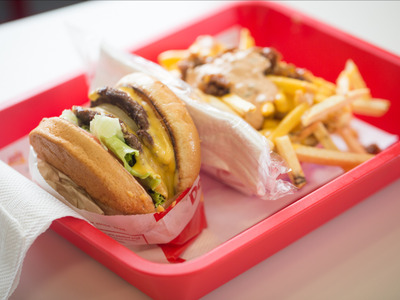 And highly rated In-N-Out Burger perks mentioned on Glassdoor include free burgers, reasonable paid time off, and a 401(k) plan. Forbes reported that full-time In-N-Out restaurant associates made $US13 an hour and received health insurance. Melia Robinson/Business InsiderSnyder worked at an In-N-Out restaurant when she was 18. In other words, the 70-year-old burger chain provides employees with good wages, solid benefits, and a chance to grow their careers within the company. What’s more, Snyder knows what it’s like to work in an In-N-Out restaurant – when she was 18, she worked at one in Redding, California, according to Forbes. She also worked in the chain’s corporate office before ascending to the role of president in 2010, at the age of 27. Snyder also told Forbes about her dedication to preserving In-N-Out Burger’s culture. Snyder’s grandparents founded the first In-N-Out in 1948, and the family has since turned down lucrative offers for the chain.